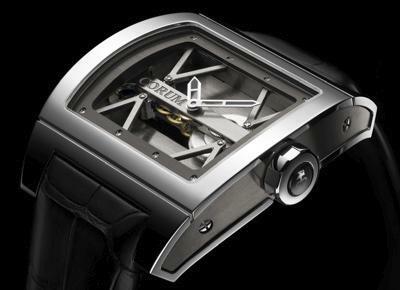 CORUM raises the curtain on its classically elegant and resolutely contemporary Ti-Bridge model. This powerful and technical watch houses CORUM's second mechanical movement, the new Caliber CO 007. Stemming from CORUM's well-established expertise in the field of exceptional movements, this timepiece houses a new and exclusive caliber designed, developed and assembled in-house; and is writing a new chapter in the company's rich history. The Ti-Bridge is all set to cause a sensation. In unveiling its second in-house caliber, CORUM is entering a whole new era. The CO 007 movement is clearly inspired by the legendary Golden Bridge caliber, while giving a whole new twist to the original concept. Whereas the shape is immediately recognizable, the dimensions, the components and the technical characteristics are all completely different and testify to the resolutely contemporary spirit of the CO 007. As the first model to house this new caliber, the Ti-Bridge heralds the advent of a new line of CORUM collections. Understated elegance and modern design meet and merge to create a perfect balance between design and technology. A truly exceptional horological creation, the Ti-Bridge marries technical excellence with contemporary design. It is also entirely in harmony with the existing creations by CORUM, a brand which has since its founding consistently expressed the mood of the times through its successive timepieces. Built around the new linear CO 007 movement, the Ti-Bridge reveals its style through taut lines and a resolutely dynamic character. A timepiece that naturally meets the lofty standards of Haute Horlogerie, it sublimates watchmaking tradition by expressing it an eminently modern manner. Melding sophisticated design features and architectural codes with contemporary materials, the Ti-Bridge immediately establishes itself as a benchmark model. 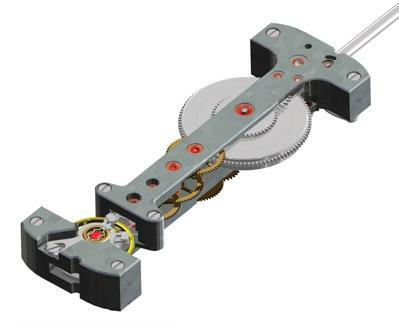 In both its movement and case, the Ti-Bridge gives pride of place to titanium, a material known for its lightness and the difficulties involved in machining it. The bridges and plates of the Caliber CO 007 are cut from this ultra-modern material. The meticulous finishing on all movements is typified by the upper bridge engraved with the 'CORUM' brand name. The bridges are satin-finished, while the generously sized barrel features a snailed finish. Equipped with a balance oscillating at the speed of 4 Hz, Caliber CO 007 is endowed with a 72-hour power reserve. Intimately linked to the movement in that it is also made from grade 5 titanium - the only kind that can be polish-finished - the curved tonneau-shaped case measures 42.5 mm by 41.5 mm. Topped on the upper part by a large convex sapphire crystal, the case has a satin-finished case-back enhanced by a central rectangular sapphire window revealing the movement. This black PVD-coated crystal subtly filters the view of the movement, offering tantalizing glimpses of the interlacing pattern of its inner workings. Comfortably cambered and water-resistant to 50 meters, the case is graced with alternating surface finishes - polished on top and satin-finished on the side. 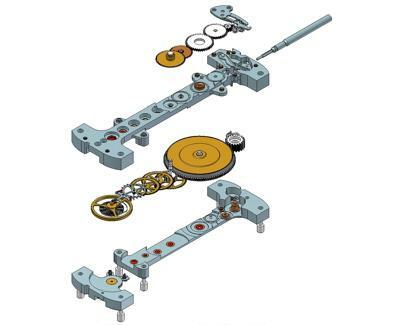 The movement is secured inside the case by a set of two titanium 'cross bars'. Screwed to the flange, which is itself integrated within the case, they contribute to consolidating the whole construction and to enhancing the aesthetic quality of this model. The openworked Superluminova coated hands guarantee optimal nocturnal visibility. The Ti-Bridge is teamed with a crocodile strap equipped with a titanium-capped triple folding clasp. A truly precious and exclusive model, the Ti-Bridge will be issued in a limited production run of 750 only in 2009.